Brooks Caldera 2 are neutral trail running shoes. There are not many changes in Brooks Caldera 2 basically because there is no urgent need after great peformance from first edition. 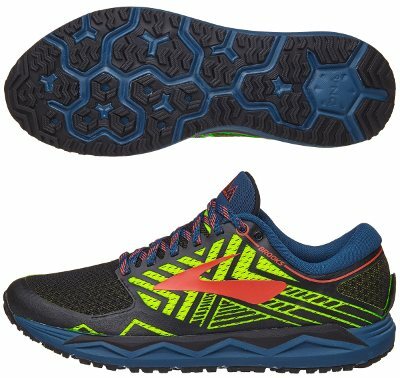 Within trai running lineup the Caldera 2 is located between flagship Cascadia 12 and fast Mazama 2, a great option for long distances preferably dirt tracks or any not too technical paths. As typical annual update, upper is the only area which changes compared to its predecessor Caldera so Brooks can justify (almost mandatory) price increase. Toebox is now narrower, something appreciated in mid/short distances but that may cause some trouble in longer ones. Based on dual layer Ariaprene mesh for enhanced breathability there is a Cordura AFT piece which embraces midfoot for secure and snug fit and extends up to toe bumper to protect better against debris. Besides high quality materials and superb comfort from Brooks, there are some excellent details like lace pocket in tongue and velcro gaiter trap on the heel that are really appreciated and definitely will influence purchase decision. Rest of Caldera 2 remains unchanged (even aggresive 4 mm drop) with impressive midsole which not only provides plush cushioning but also protects sole from sharp objects without specific rock plate. Midsole is made of reliable BioMoGo DNA, foam used by several Brooks running shoes like popular Ghost 10 because of great performance. It is surprising to see no changes in outsole, probably the part of the Caldera 2 with more room to improve which features a versatile design with not very deep multidirectional lugs that adapt well to different terrains without outstanding on any.